A few years ago I purchased a floor pump for inflating bicycle tires that would work on both Prsta and Dunlup valves, since I had bicycles with both. After a while I started to realize that I had no idea what pressure I was inflating my tires at, and sometimes felt like they were too soft. Modern tires have the correct pressure range printed on the side, using them at a pressure that is below or above it increases the risk of punctures and can wear out the tire faster. After trying the Topeak JoeBlow Sports with it's built in manometer I was very impressed. While my old pump would require a lot of force after getting some air in, while I could feel it bending. Pumping with the JoeBlow felt much lighter and, and thsu I decided to purchase one. My goal was to get a pump that can inflate the tires of any bicycle, to any pressure, can last me a long time. The biggest problem with my previous pump was that there was no way to tell the pressure of the tire. The JoeBlow sports features a Mamometer that shows the exact pressure while pumping. There is even a little indicator that you can move to the desired position, and then keep pumping until the needle moves below it. Because you don't need to stop to feel how hard the tire is with your finger you can keep pumping, and reach the correct pressure much quicker. The pump and manometer go all the way up to 11 bar (160 psi), which is more than any bicycle tire could ever need. The base is made out of steel and very wide, which makes the pump very sturdy, better than any other pump I have used. The main tube is also made out of steel, which makes the pump feel solid. 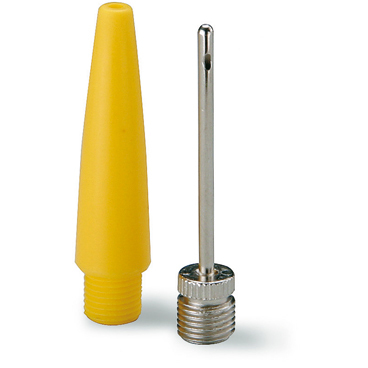 Ball needle and bladder adapter are included with the pump. The twinhead can connect to three different valve types. 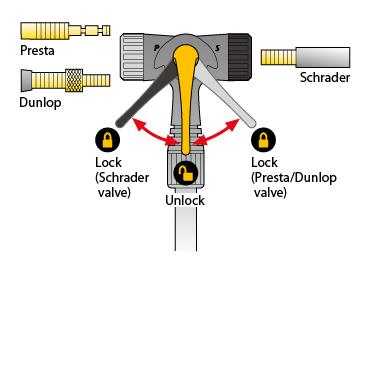 The pump has two connectors, one for Presta and Dunlop valves (gray) and one for Schrader valves (black). They are color coded, so you just need to remember which color belongs to what kind of valve. It also comes with an adapter for inflating things like air mattresses and balls. It works okay for small volume inflatables, but anything larger than an inflatable pillow takes a lot of pumping. Another nice thing is that Topeak sells a whole bunch of spare parts for the pump, which makes me feel reassured that I can fix it, even if some part of it breaks. To use the pump place the head over the valve and turn the lever away from it to lock the head to the valve, as soon as you start pumping the manometer will display the current pressure. Every stroke pumps a lot of air, so even wide "balloon" are quickly inflated to the right pressure. Pumping feels smooth and light. It does not feel like any risk of bending or breaking anything, when applying much force. I am very impressed with this pump, so far it seems to be everything one could ever need. It fits all valves and inflate tires up to the highest pressure. As a bonus it can also works on other inflatable objects and is servicable with spare parts should it ever break. The Max HP/II pumps are a little cheaper, and use some lower quality materials liek a "composite" base instead of hardened steel, otherwise pretty much the same, but does not seem to be as widely available as the Sport pump. Comes in different colors. The Race pump goes up to 14 bar (200 psi), but has a smaller cylinder, which means leass air per stroke. Comes in different colors. The Mountain pump has a wider cyclinder, which means more air per stroke, but only goes up to 5 bar (75 psi), which is not even enough for a city bicycle, which really limits the use of the pump to wide tires only. Then there is the Sprint that goes up to 11 bar, and is made out our aluminum and carbon fiber, which makes it 150 grams lighter than the Sport, but carries a heavier price tag. It does have an air release button which allows you to release air in a controlled manner while you can monitor the pressure. This can be useful if you regularly change the pressure depending the terrain you are riding. According to Topeak the Pro is very durable, it features an air release button, but lacks the twinhead. It requires an adapter to attach to Dunlop valves, and is more expensive than the Sport. The cream of the crop is the Ace pump, which is four times the price and features an adjustable cyclinder depending on the desired pressure, so that you never need to apply too much force. It goes up to 18 bar (260 psi) and weighs 2.4 kilos, which is much more than any of the other pumps.